The iPhone X is possibly the most exclusive iPhone to date. It stands out from the crowd to be one of the most powerful, and premium, smartphone release of recent months. 2017 saw Apple marking a decade since the release of the very first iPhone. The iPhone changed the whole face of smartphones and how we’d used them before then, so we all knew that Apple would want to do something pretty special for the tenth year as an industry leader. Enter the iPhone X: the most premium, and expensive, iPhone to date. The iPhone X was launched alongside the iPhone 8 and 8 Plus, but there was absolutely no doubt that it took centre stage when it was announced. Despite the high price tag, Apple’s loyal fans couldn’t wait to get their hands on the latest release from the tech giants, and many bypassed the 8 models to wait an extra month to pre-order the X. By now we’re used to seeing the launch of iPhones that, while they may have some serious upgrades in terms of internal hardware, do tend to have a distinct style to their design. Apple knows how popular their iPhone design is, and as a result, they appear to be hesitant to make any drastic changes. The iPhone X is slightly different, and we’re sure that this is intentional, it definitely stands out against other iPhone handsets. It’s a little larger than the iPhone 8 Plus, with a 5.8-inch screen. With that being said it retains the minimalist feel that we’ve come to know and love from Apple, with no bezels and a front that is essentially all screen. This means that there’s no room for a fingerprint scanner on the iPhone X, and so the only way of unlocking your handset is through Apple’s expert facial recognition technology. It doesn’t just look great, the design of the iPhone X is also durable. It comes with IP67 waterproofing meaning it should survive up to 30 minutes submerged in water. There’s also Gorilla Glass reinforcement, but we would always recommend investing in a decent case and screen protector; this is one expensive phone and replacing a broken screen on the iPhone X will cost you a pretty penny. 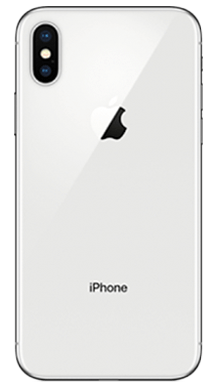 Whereas you can usually choose from a few different colours with iPhones, the iPhone X is only available in silver and space grey. We have to say that we feel that silver is much more striking, but the space grey has a decidedly professional feel to it. The screen on the iPhone X is an OLED display rather than the usual LCD display that Apple use. While iPhones generally have a stunning screen quality, we have to say that the iPhone X really stands apart from the crowd. Colours are incredibly vivid, yet natural and shadows and highlights are handled perfectly. The display handles being in bright sunlight extremely well, so you won’t run into any big problems when trying to view content on your handset, wherever you are. The iPhone X uses the very same True Tone adaptive colour temperature system that can be found in the iPad Pro. This technology strips the blue light out of the display helping warm up the natural colours. If you read about our other iPhones at Metrofone, you’ll already be well aware of just how impressive the audio quality is. The iPhone X is no different; we were extremely impressed with the sound on this handset. While we’re always used to the fact that Apple doesn’t offer hi-res support for music files, we would have thought it would have been included on the iPhone X, with it being the most premium offering from the brand. Not that it's a serious issue; the sound quality of the bass is very clear and detailed while treble is kept in balance, delivering an overall exceptional audio experience that will keep any music buff happy. If your listening to music without your headphones then you’ll notice just how impressive the stereo speakers are on the iPhone X, they are noticeably better than any other iPhone handset. There is, unsurprisingly, no headphone jack on the iPhone X. By now this doesn’t bother us, or the majority of other iPhone users, as we’ve become accustomed to this feature since the iPhone 7. You can use regular headphones with the iPhone X through the charging port and adapter, but we’d recommend going for a pair of wireless Bluetooth headphones; they’re reasonably affordable these days and make life so much easier. The camera setup of the iPhone X means that it truly stands out from competitors in this department. It features a dual lens on the rear with optical image stabilisation on both lenses. The sensors use larger, deeper pixels to ensure fantastic performance even in low light, and the telephoto lens allows you to focus in closer on your subject without losing any important detail. The omittance of the fingerprint sensor means that the only way to unlock your iPhone X is through facial recognition technology. Apple really has nailed this complex feature, and the iPhone X will carefully analyse your facial features so that it will even recognise you with facial hair or if you have glasses on. There’s even the ability to make it so that your iPhone will only unlock with attention, so the user has to have his or her eyes open for the technology to work. You can do this in the settings app on the iPhone X, and it really is a great added security feature. The iPhone X uses Apple’s latest iOS 11, but will, of course, be upgradable to newer versions as an when they are released. Apple has opted to use the same A11 Bionic chip that was used in the iPhone 8 and iPhone 8 Plus. This super-fast processor delivers an incredibly fast smartphone experience; you don’t need to worry about finding any delay here, even if you’re using multiple apps at the same time. The battery on the iPhone X is significantly better than other iPhones, and it is, of course, compatible with wireless charging, which is an added luxury that we’d expect with such a high-end smartphone. If you need a quick power boost, the iPhone X will use fast charging technology to give you a significant battery increase in around half an hour. It’s no secret that the iPhone X comes with a hefty price tag, but you really do get a lot of Apple’s finest technology inside the handset to make it a worthwhile purchase. 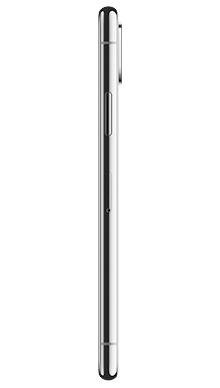 The design is stunning and it really stands out from other iPhone handsets. The iPhone X fulfils Apple’s vision to create a smartphone that is entirely screen, and with that comes a minimal design that looks incredibly sophisticated and premium. The screen and sound quality are exceptional and combine to deliver a viewing and audio experience that is second to none. The camera too, is extremely impressive, with optical image stabilisation on all lenses and Portrait Mode on both the front and rear shooter. photographs come out to an extremely high standard and this phone will really help you feel like a pro when it comes to taking pictures. The iPhone X runs on the A11 chip, much like the iPhone 8 and 8 Plus, meaning that you'll find the same smooth smartphone experience on this handset. The battery is fantastic, and when you do run out of power you have the luxury of fast and wireless charging to help you power up quickly. 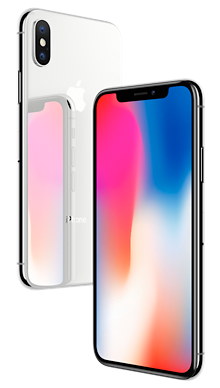 Even though the iPhone X is the most expensive iPhone to date, at Metrofone we’ve been on a mission to find you the best iPhone X deals and save you as much money as possible. At Metrofone we partner exclusively with EE so that we know that our customers have access to the best network service and connection wherever they are. Whether you’re looking for fantastic extras, a great cashback offer or bags of data, MEtrofone has you covered. 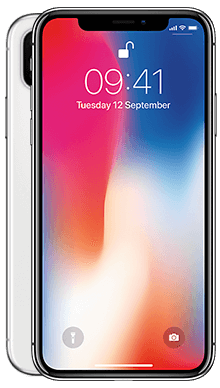 A great added bonus of choosing the iPhone X on EE is that you not only get to take advantage of incredible deals that give you unlimited minutes and texts, with loads of data, but you can also take advantage of fantastic extra perks. For example, you could choose a subscription to BT Sports to make sure you don’t miss out on all of the latest sporting action, as well as six months free Apple Music where you don’t even need to worry about paying for the data! 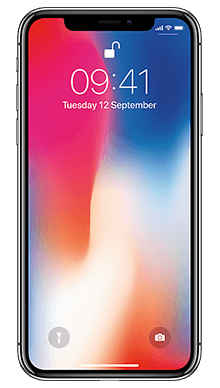 Going for the iPhone X is a big decision, so if you’d like to find out more about the phone, or if you’d like to find out more about a specific deal with Metrofone, then why not call one of our great customer service team today, on 0333 900 1144.